Posted on December 1, 2016 , in Hot Tubs. If you have questions about how much it costs to run a hot tub, you should know that it depends on a variety of factors. From insulation to the quality of the hot tub, there are many things that can make your bills higher or lower. A high-quality hot tub costs between $1.00 and $1.50 per day to run. Below, you’ll learn about some of the world’s most efficient hot tubs from Hydropool and how their recent innovations have helped owners save big. Since Hydropool hot tubs first came to exist, their insulation has been evolving. The first models used foam insulation to hold in heat. Although it held in more heat than other hot tubs, it couldn’t retain heat that was expelled from the pipes or motor. There were also problems with service because technicians had to unearth plumbing to take care of leaks. This led Hydropool to implement a perimeter insulation system. The benefit of this system was that it insulated the walls and was also able to hold in waste heat that escaped from the well and pipes. Although this system was much more efficient than the previous one, there were problems with the cabinet overheating due to insufficient air flow. It also suffered from leaks and lack of plumbing support. Through ongoing innovation, Hydropool began utilizing NASA technology to develop superior insulation. They used a thermal shield blanket with thick covers and thermal vents. Not only did these changes prevent overheating, but they also retained waste heat from the cabinet. Eventually, this resulted in the Hydrowise Triple Thermal Shield System. When you’re looking for a hot tub that will save you energy, there are many features to look for. Make sure the hot tub has heat locking technologies as well as adjustable venting. This will ensure that all waste heat from the motor will be used and lower your energy bills. 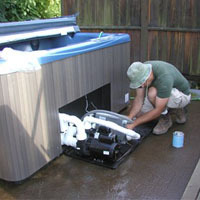 Seeking out a hot tub that is Commission for Environmental Cooperation approved is another sure way to save energy. CEC approved hot tubs are some of the most energy efficient options on the market. You should also know the filtration rate. Hot tubs that filter water more quickly will always be more energy-efficient than those with slower filtering. Low-amperage filtration pumps are also great energy savers. Hard covers, especially those that have 3- to 4-inch tapered covers with insulated bumpers are also good choices for retaining heat. Sealed cabinets and plastic flooring will also offer you phenomenal insulation during cold weather. Now that you’ve learned how to save energy with the right hot tub, it’s time to start looking for the best hot tub for you. To learn how to select the right hot tub for you, download our Hot Tub Buyer’s Guide!